In 1945, the basic Delta Band Saw was known as Model No. 890. Delta studied the whole field of band saw work and after hundreds of band saw users had been consulted to determine the most useful capacity for a medium sized machine, they settled on the 14" x 6" size, meaning that the maximum width of cut between the band saw frame and the blade was 14" and the maximum height of the cut between the table top and the upper blade guide was 6". Delta researched and discovered that since over 90% of all band-saw work is done outside of the table, on the side away from the frame, the 14" capacity is fully as effective as that of any other band saw, no matter how large. In the comparatively few cases where the "swing" of the work required a larger throat capacity, it was found that a band saw of 20" to 24" swing was required, and the the addition of one or two inches to the throat was of no practical value. Similarly, since over 90% of all band-saw work is done on stock less than 6" thick, to provide greater capacity than this is merely to penalize the user who does not require it. So Delta decided upon a standard machine that cuts up to 6" thick and they offer an attachment that will increase the capacity to 12". The Delta Band Saw Model No. 28-207 provided the complete 14" Woodworking Band Saw as shown in the photos on the right and left. It included the open steel stand as shown. Model No. 28-205 included the same saw on a cast iron stand. The Delta Band Saw has changed very little over the years. 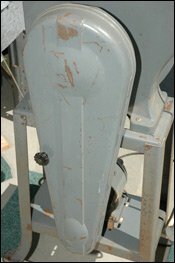 Delta patented a design for the band saw that included the slot for entering the blade to run to the side of the table. In all other machines of this vintage, the slot ran to the front. This older type had several disadvantages: The use of the front slot practically forced manufacturers to use a single trunion mounted at one edge of the table. This meant a loss of support at the front of the table and less rigidity. It also meant that in order to remove or install a blade, any fence rail that might be attached to the front of the table would need to be removed first. With the Delta patented construction, the table is solidly supported on two widely spaced trunnions. This double table trunnion design provided much greater rigidity and since blade could more easily be installed without removing fence rails, more convenience. The Delta Band Saw also offered fully adjustable, micrometer blade guides that made adjustments fast and accurate. On most medium-sized band saws and on many larger ones, the blade guides are not necessarily fully adjustable. That is, the blade support moved with the bracket carrying the blade guides, so that the adjustment of the blade support automatically meant that the guides must be readjusted. On the Delta Band Saw design, the guides were adjusted independently of the blade support-- The guides were adjusted to the thickness of the blade and set to the tooth depth without affecting the adjustment of the blade support. Similarly, the blade support can be adjusted without effecting the guide adjustment. Some band saws had guides above the table only, but on Delta Band Saws, exactly the same high-grade design was used above and below the table. The lower blade guide comes within 3/4" of the bottom of the work, to give maximum support to the blade. Delta provides a Riser Kit to extend the cutting height of the band saw from about 6 inces to about 12 inches. You can see more about How to Install a Band Saw Riser Block here. Accessories for the Delta Band Saw included the No. 894 Height Attachment and the Delta Band Saw Rip Fence. No. 890. 14" Wood Cutting Band Saw with Wheel Guards, 8" Arbor Pulley. The Delta Band Saw heavy gauge open base splayed leg stand provided a sturdy base for the 14" band saw. It also included bolt patterns on the lower shelf to mount the motor. The accessory No. 1334 Switch Rod could also be mounted so the motor on-off switch was easily accessible to the machine operator. The motor pulley and belt guard could be used on both the open steel or cast iron stands. It fit over the 8" diameter arbor pulley and the smaller standard 2 3/4" motor pulley moutned on the lower shelf of the stand. The No. 894 Height Attachment increases the capacity of the 14" band saw from 6" under the guide to 12 1/4". It could be added any time and required the use of a 105" blade. The height kit included a cast block, dowels, bolt, extension front blade guard, and a wooden back blade guard. The newer back blade guards were made of plastic. No. 882 Lamp Attachment. Includes shade, socket, cord and attachment parts. Used 15 or 25 watt bulb. There was nothing quite the equal to the No. 882 lamp attachment to bring plenty of light to your work just where it is needed in volume enough for accuracy in following layouts, yet not bright enough to glare. 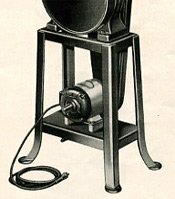 The lamp could be swung on the brackets of Delta Scroll Saws, Drill Press, or Band Saw or could be easily attached to any other machine. The band saw rip fence added to the functionality of the band saw by allowing you to use it to cut straight pieces of stock.